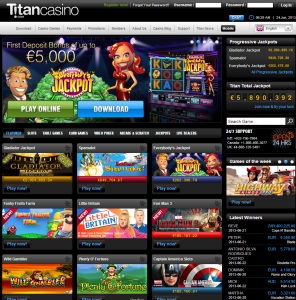 Titan Casino is a fully-fledged download casino that offers hundreds of slots and casino games. The quality of the games is high, the animations are professional and modern. 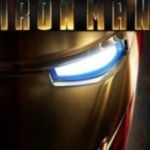 Titan even has a casino blog that is updated regularly with gambling tips and advice. Titan Casino offers a great variety and number of casino games. Players can choose from close to 100 slots. There is virtually no theme that you can’t find in this casino; there are sport slots (Ice Hockey, Football Rules, Tennis Stars), there are movie/comic slots (Pink Panther, Daredevil, The Mummy) and adventure slots (Desert Treasure, Bermuda Triangle). Many slots also build up a progressive jackpot. 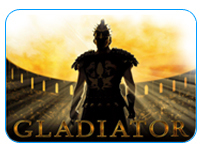 Some of the popular slots are also available as scratch card games, such as “The 6 Million Dollar Man” or “Gladiator”. Apart from online slots, you can also play traditional casino games at Titan casino. 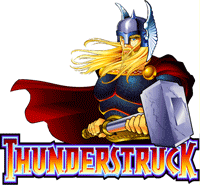 There are several Blackjack versions, including a multiplayer and a progressive version. Roulette also comes in different variants, such as American and a multiplayer roulette. Titan Casino also serves fans of poker with several video poker games and casino Hold’em. Furthermore, you can play arcade games, such as bowling or darts. And if that’s not enough for you, you can also try out Titan’s Live Casino, in which you can play Roulette, Blackjack and Baccarat with a live dealer. When you register an account, Titan casino asks you to provide contact information, such as your address and phone number, along with the usual username and password details. Titan Casino is a download casino; so in order to play on your computer, you need to download the Titan software. Unfortunately, the software only works on Windows computers, not on Mac or Linux systems. There is a mobile version of the casino for smart phones that you need to activate with a code sent to your phone via SMS. The mobile Casino is limited in the amount of games offered; currently you can play about 15 slots and games. It is possible to try out Titan Casino’s games and slots online in the so-called “Practice mode”. This mode runs in your browser via Flash. The downloadable software also lets you play for free if you want. There is a 5000 € welcome bonus at Titan Casino. If you deposit more than 1000 €, you will receive a 50% bonus of up to 5000 €. If you deposit less than 200 €, you will get a 100% bonus. Moreover, active players can receive weekly loyalty bonuses and “comp points”. Titan Casino accepts VISA, Mastercard, Paypal, countless e-wallets such as Neteller and Skrill, Paysafecard and Ukash and many more. There is a 24/7 customer support via phone, e-mail, and even live chat. Titan Casino is a very professional online casino. This professionalism becomes apparent in their great game variety, excellent graphics, attractive bonuses and promotions, and 24/7 customer service.